This soft body brush makes it easy to reach areas such as your back of neck or knees and feet to gently stimulate and cleanse. Brushing the body has a massaging effect that will improve blood circulation and metabolism. The brush handle is slightly curved, making it easy to brush hard to reach areas such as the back. Soft bristles are gentle yet stimulating. Creates a rich lather while stimulating skin and blood circulation. A wonderfully practical and great performing body wash towel from Japan that will let you say goodbye to loofahs and cotton cloths. Exfoliates like a dream with tons of rich lather. More hygienic than a loofah, longer and faster-drying than a cloth towel. for stimulating cleansing with great lather! TrueRenu has one of the largest Japanese Wash Towel and Bath Salts collections available - from the award-winning Salux brand, the Cure series and luxurious silk from OHE, Aisen and Okazaki. TrueRenu does the searching - and researching - for you, scouring the world for hard to find, hard working products. We carefully evaluate them, making sure that do what they promise, and we bring them to you with detailed descriptions. 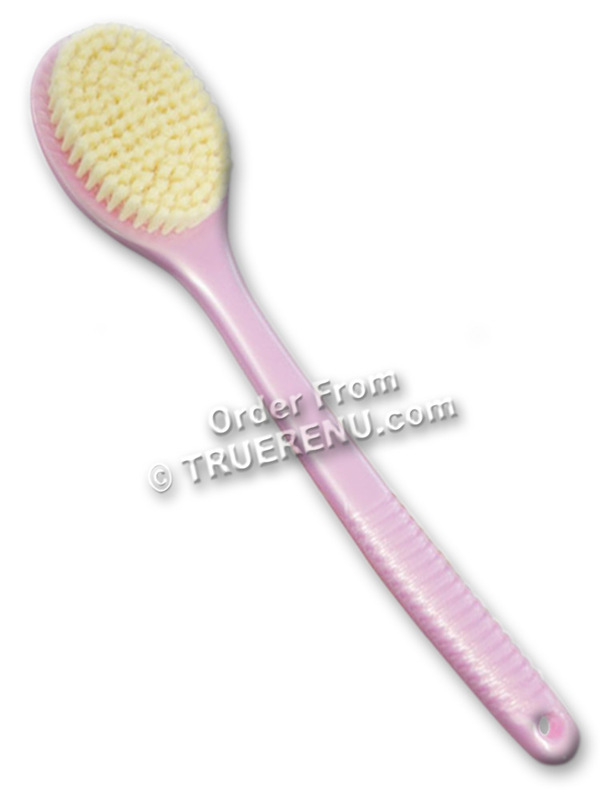 Slowly and gently use brush in circular motion to build lather while cleansing and stimulating skin. Works best with body wash. Do not use excessive force. Ingredients: Handle = 100% Polystyrene, Brush = 100% Acrylic. Product Size: Pink. 36.1 cm (14.2 in) long handle, 8.1 x 5.7 cm (3.2 x 2.25 in) oval brush. Quick-drying towels will have you putting away the loofahs and wash cloths for good. Unique multi-textured weave has both fine and thick threads to maximize the lather from liquid body soap.